Firm Foods 100% Whey is composed exclusively of whey protein, 100% pure, ultra concentrated and micro-filtered. No added sugar or proteins with lower bioavailability such as soy or wheat protein. 100% Whey from Firm Foods is the smart choice for the evolved consumer. 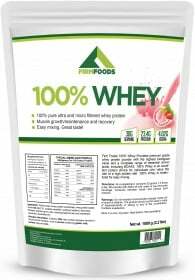 Effective, tasty and available at a very competitive price, 100% Whey from Firm Foods is the best choice, satisfaction guaranteed. * There may exists small differences in the nutritional information depending on the flavor. Have a question about 100% Whey? What is it, what does it do, how and when to use or something else? Ask us. Best ever made protein, at the best price! Thanks zumbu! GREAT PRODUCT, GREAT STRAWBERRY TASTE AND AS ALWAYS FAST DELIVERY FROM ZUMUB. I CAN'T FIND A BETTER PRICE AND SO I WILL BUY IT AGAIN. THANK YOU. “100% Whey 30g (1 serving)” is currently out of stock. Enter your details below and we will let you know when it's back in stock. ALLERGEN INFORMATION: Contains milk ingredient.,May contain allergens handled in the production facility: cereals containing gluten, soybeans, milk, lactose and nuts. As a supplement, consume 30 grams 1-3 times a day. Mix powder with 300 ml of Milk, Water or your favorite beverage. Consumed between meals and always post-workout. WARNINGS 100% Whey : Do not exceed recommended dosage. Keep out of reach of children. The product should not be used in case of hypersensitivity or allergy to any of the ingredients of the formulation. Contains sweeteners. Food supplements should not be used as a substitute for a varied and balanced diet and healthy lifestyle. Store in a cool, dry place. Please Recycle. BEST BEFORE: Please see lot number and expiration date stamped on the packaging.